More than a third of Africa's citizens should have access to broadband internet by 2012, a conference of technology leaders is set to hear. 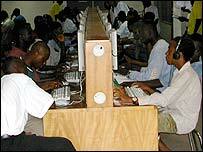 Fewer than four out of 100 Africans currently use the internet, and broadband penetration is below 1%. The barriers to broadband access are key talking points at the Connect Africa meeting in Kigali, in Rwanda. 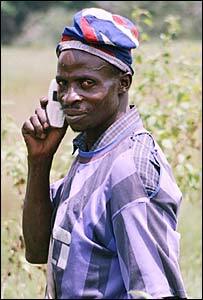 Dr Hamadoun Toure, head of the International Telecommunication Union has called for "immediate action". The conference features representations from organisations such as the World Bank, World Health Organization and United Nations, as well as high-profile technology leaders such as Intel's chairman Craig Barrett. The attendees were all invited to make financial commitments to improving technology and telecoms in the continent. More than $3bn has been pledged so far. Dr Toure said that despite the bleak picture of access issues in Africa there was plenty of opportunity. He told the BBC News website: "If you have just 1% of broadband access today you have 99% of opportunity. "The good news is that Africa has had the highest growth in mobile use globally - twice the global average over the past three years. "For the first time economic indicators are positive from Africa." In Rwanda, access to the net is limited and high-speed connections are rare, the BBC's Digital Planet programme was told by officials and users in the country. "Not many students are able to connect to the internet at the same time," said Marie-Josee Ufitamahoro, a student at Kigali institute of technology. "For example, a class of 40 students requires each pupil to be connected, so what we need is bigger bandwidth so we can share ideas with other students in other parts of the world." Albert Butare, Rwanda's state minister for telecommunications and energy, said the issue of bandwidth was critical. "It's what governs the speed of the internet, the quality of the connection, whether or not you can do video conferencing," he said. "If you are talking about telemedicine or distance learning, you need images and clear audio." Dr Toure said the conference needed to take action on regulatory issues in some African countries, which often tie down the roll-out of net access. "The heads of state present will give assurances to the private sector on the availability of competition and the creation of a proper regulatory environment for them in which to evolve," he said. "The private sector from outside Africa and inside will make fruitful partnerships." One of the biggest problems facing internet development in Africa is a lack of interconnectivity. More than 70% of internet traffic within Africa is routed outside the continent, driving up costs for business and consumers. "This is a serious problem and will be discussed," said Dr Toure. But he said Africa should not be looking for special treatment from the technology private sector. "Africa has to create the opportunities; Africa doesn't need charity," he said. "We need to make sure we have a good environment that will attract private sector investment. There's nothing wrong with making profits in Africa." The International Telecommunications Union says more than $8bn was invested in telecommunications infrastructure across Africa in 2005. Dr Toure said the challenge for the ITU, technology leaders and companies was to help Africa meet its Millennium Development Goals by 2015. In the technology sphere, that means easy access to information and communication technology for more than half of the continent's population within eight years.